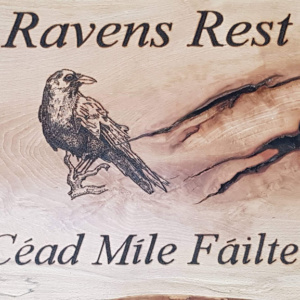 The Raven’s Rest camp site is nestled in a valley between the towns of Tinahely and Hacketstown, where you will find shops, pubs and restaurants. We are on the Wicklow Way, one of Ireland’s finest walking routes, with beautiful mountain scenery. Learn more about local towns and attractions below. The Courthouse Arts Centre, Dwyer Square, formerly the civil courthouse building. Musical performances, artist exhibitions, play and film screenings. Public library, Dwyer Square, formerly the town market house. Walking route along the line of a former railway. It leads from Tinahely to Tomnafinnoge Oak Wood in the nearby town of Shillelagh. Three new circular waymarked trails were opened in 2010. Tinahely is also close to the Wicklow Way, one of Ireland’s most popular long-distance trails. The Tinahely Agricultural Show takes place annually (for over 70 years!) on the first Monday of August (a bank holiday). Community Center located on grounds of original national school on School Road. St. Kevin’s Church, Kilavaney, (Roman Catholic). St. Peter & St. Paul Church, Crossbridge (a sub-parish of Kilaveney), (Roman Catholic). Kilcommon Church, Parish of Crosspatrick and Carnew Group, (Church of Ireland). Find out more on the Tinahely.ie website. Hacketstown is a quiet and traditional Irish village, with pubs, restaurants and shops. Check local listings for music nights and other events. Perhaps the most famous natural attraction of Co Wicklow. Glendalough, the valley of the two lakes boasts some of the most beautiful natural scenery in the world. Learn more at the Glendalough.ie website.